As in many schools, my high school library is a hub of our building. Hundreds of students walk through our doors each day; administrators stop by; teachers are posted to duty at the circulation desk every period; custodians and security guards come to say hi; classes learn research–it is a space filled with energy. Because of my place in this bustling library bubble, I’m surprised every time I hear a teacher’s name I’ve never heard before. I’m only in my second year at my school, but I’ve made a point of going out of my way to meet as many teachers and employees as possible. There are still some people, though, with whom I have yet to connect. Whether it’s a teacher who has a chaotic schedule and a classroom on the other side of the building, or an administrator who works in an off-site office, there are circumstances that prevent us from meeting or collaborating. As I contemplated how best to reach all staff members, I thought of putting out digital updates and landed on the idea of creating a monthly newsletter. After finding a design I liked on the Internet, I reached out to the school librarian of that school, who quickly answered my format questions (I’m always amazed at how friendly and helpful the library community is! ), and I sent my first newsletter out the next month. I used Pages on my MacBook because I couldn’t find a comparable layout with any other software, but there are endless possibilities available. 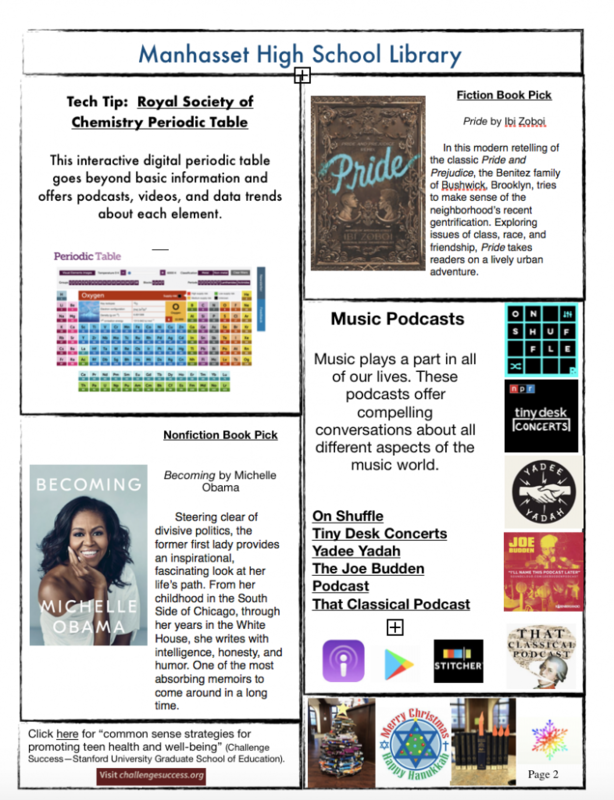 Not only have the newsletters generated both digital and in-person conversations with other staff members, but they have helped me highlight the school library’s purpose, spread helpful resources to academic departments, and showcase some of the students and events in our library. I’ve found that the simple, compartmentalized format is easy to access, and people have told me that they enjoy seeing photographs of students and staff members. I’ve realized that teachers are no different from students in appreciating quick bits of information that don’t take large amounts of time to process. I’m pretty sure that if I had circulated a newsletter that was filled with blocks of dense text and in-depth blog posts, I would have lost a lot of people’s attention, given the overwhelming responsibilities of the staff members here. And since the students rarely browse our library web pages, I display a color copy of the newsletter in an acrylic display stand on the circulation desk for them to see. As each month passes, I use the feedback I receive, incorporate innovative ideas I encounter, and continually work on improving the final product I present. It’s still a work in progress, but I feel a sense of accomplishment when I compare my first newsletter to my most recent and see how much it has improved. 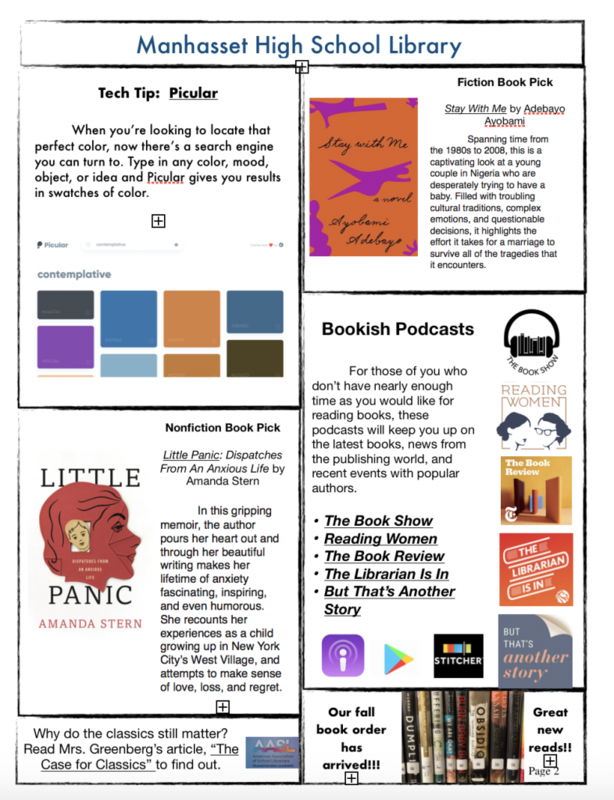 In addition to reaching our own staff, the newsletters have circulated within the community as well: the teen librarian from our local public library reached out to me and asked if she could display my monthly newsletters in her teen room. She recently told me that she notices many teens looking through the binder that they’re in. I’m happy that I found a way to open up the world of our library to everyone, even those who never step foot inside. To see all of this year’s newsletters click here.To see last year’s newsletters click here. ‹ What does $500 buy you? I too do a monthly newsletter, but I have not received much feedback (from students or staff). You have given me additional ideas to incorporate in my upcoming issues. Thank you. I really like this! 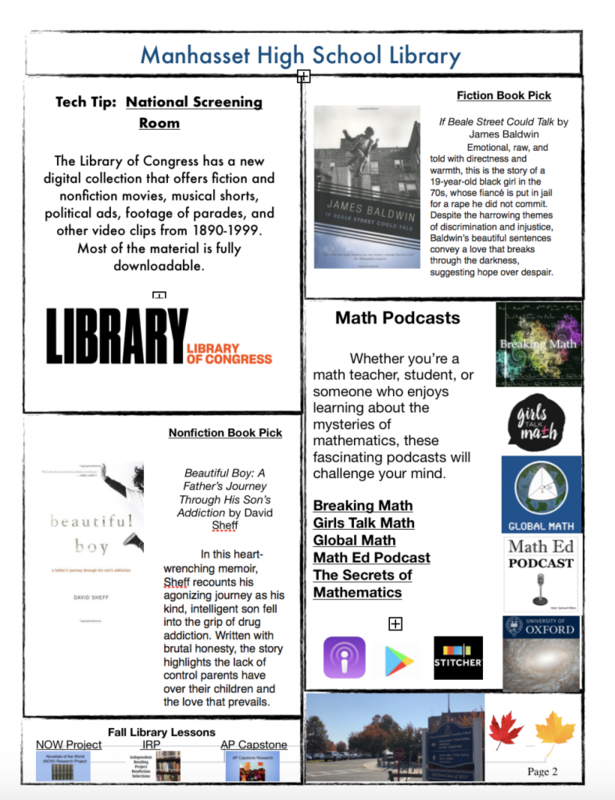 I have been thinking about updating the look and style of our middle school newsletter and this is inspiring to me. (Plus I’ve been really bad about keeping it updated) Thank you! Love this format–thanks so much for sharing!